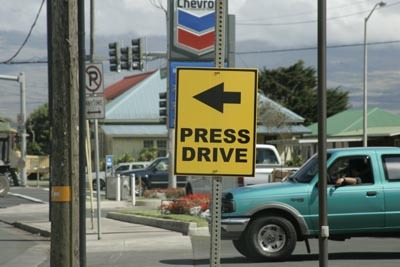 More Press Drive signs in Waimea this time. Also saw these signs in Waikoloa. Reed enlightened us as to what they probably were. When a car maker has a new car they invite members of the press, mostly car magazines like Road & Track, Car & Driver, etc., to drive the new model cars around so they can do a write-up. This was pretty much confirmed as there was a sign up in Holualoa that said something about 2005 Lexus on the Press Drive route. And later on Sunday I saw a Lexus sign, a crowd, cranes, scaffolding and Lexus cars up on a stage at the Kiholo Bay lookout on the Queen Kaahumanu Hwy. Must be nice to be flown to Hawaii to drive a Lexus around for a write-up. Would the Yugo have fared better had they done the same?